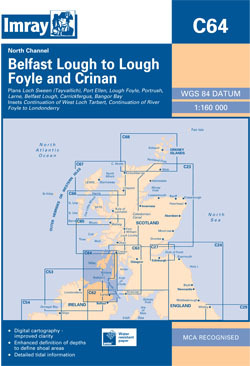 The north-east coast of Ireland from Lough Foyle to Larne, and the Scottish coast from the Mull of Kintyre north to Crinan and Colonsay. Scale: 1 : 150.000. One-minute gridlines. Larger scale plans of Loch Sween (Tayvallich), Port Ellen (Islay), West Loch Tarbert, West Loch Tarbert lower part, River Foyle to Londonderry, Lough Foyle, Portrush, Belfast Lough and Larne. Insets: Continuation of West Loch Tarbert, Continuation of River Foyle to Londonderry.